This months Adventure Lantern issue has just gone live. In this issue, in addition to co-editing, I sadly provided all of the reviews. But don't worry, we do have have more authors lined up for the future. This time around, there are quite a few interesting articles. Most notably, an adaptation of a personal favourite of mine, Murder in the Abbey; A murder mystery set in a medieval Italian abbey and based on the novel The Name of the Rose. 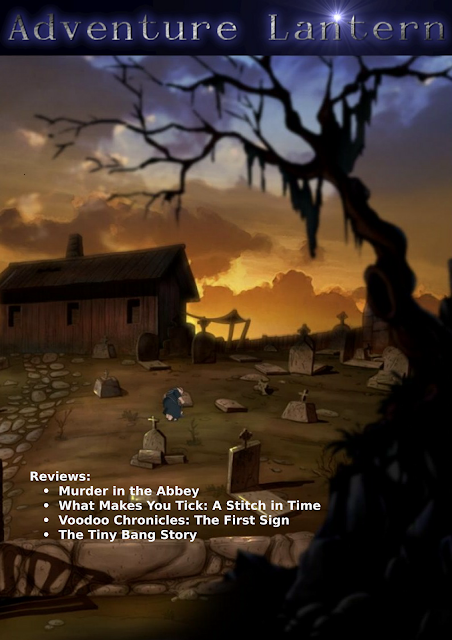 But surly the better adventure game, What Makes You Tick: A Stitch in Time also made it into this issue; And what a fabulous, overlooked, piece of adventure gaming this title most definitely is. I also got around to including the, disappointing, casual adventure Voodoo Chronicles: The First Sign, and to show that casual games are not all bad we have the beautiful The Tiny Bang Story in there as well. While there are more then enough mission walkthroughs for Skyrim, one thing that I have found is that the missions themselves do not need a walkthrough, for the most part, but one would be very useful for what missions to take on. The absolute best place to quickly get some great, early (I am still using it tens of hours in), melee weapons is with the Champions in Whiterun. After a few easy quests you get your pick of Skyforge Weapons given to you. A very good early armour set (for both light and heavy armour users) can be acquired by joining the Imperial Army in Solitude (it is quite a trek from your starting location, and you do have to take out a fort of bandits by yourself first). Also the Imperial Bow is a good starting bow and you should be able to pick one up off of a dead comrade in one of the earlier missions. Also this quest line yields a lot of easy missions that sees you fighting along-side Imperial troops and fighting armies of Stormcloaks. I am not sure if this is guaranteed or just random loot but the best bow I have ever seen, a Supple Ancient Nord Bow, I got off a mid mission enemy encountered in an early Mage College mission. One downside is that it currently cannot be upgraded any further, so while it is one of the best bows available, many bows (with some good smiting and materials) can be made a whole lot better.